The Perfection Collection of softside waterbeds by InnoMax has two models. The Frame-Free Bed and the Sponge Bed. These beds offer what InnoMax calls Gravity Neutral Support. In combination with Dual Temperature Control, this is certainly not your grandpa's waterbed. The heart of these fluid support mattresses is the water chamber. This is the support core of a Perfection water mattress. The buyer of a Frame-Free Bed chooses from among four deep-fill water chambers. The Free Flow is a "Gentle Wave" full-wave water core. This type of water support is reputed to offer the most conformity, the kind of support which made waterbeds popular in the first place. The other three water cores have fiber layers. G750 "Motionless Comfort" has 8 layers. G850 "Total Rest Advanced Comfort" has 10. The Deep Fill DG850 is a dual support water chamber, 2 half-width chambers side-by-side. The G750 and G850 boast a Mid-Body Support System with extra support under the lumbar section. The Perfection Sponge Bed is the firmest model with the least wave motion. The water chamber is the Deep Fill G950 “Super-Firm Maximum Support” with 12 layers. The total filling of the water chamber by fiber layers led to the nickname sponge. The supporting water is fully soaked up by the fiber. Like the other G-series chambers, this also has mid-body support. 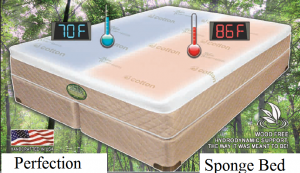 With Dual Temperature Control the temperature of the water on either side of the bed is controlled separately. Each side has its own control. Around the water chamber in a Frame-Free Bed or Sponge Bed is InnoMax's M-Rail sling. This is what holds the water core in place, gives it integrity without a wood frame. In the Perfection Collection water mattresses, the only padding atop the water support core is in the quilting. The stretch knit cover fabric is a blend of cotton with rayon made from bamboo. If a customer wants more top-side cushioning, InnoMax also makes a 2½" topper, made under the Luxury Support label. This is dual-sided, with Memory-Cell (memory foam) on one side and latex on the other, covered with organic cotton. It is reversable. Just flip it to the side with the preferred feel. Other layers in the middle tailor the support for more lift in the center section. The cover can be taken off and cleaned. Perfection waterbeds are covered by InnoMax with a 25-year warranty.